I left the hospital the other day to find real food. Stubbs bbq was about 3 blocks from the hospital and I have wanted to check it out ever since we moved to Austin. I can remember going to Stubbs in Lubbock when Mr. Stubblefield was still alive and running the restaurant. I learned to love this man. From the tour of the kitchen, to sitting in the booth with him talking about cooking, or just enjoying listening to Joe Ely. I have dear memories of Mr. Stubb. I found a parking spot in the employee parking lot and risked being towed as I headed off to find the front door. (About a block down the street) The smell wafting through the air was true and beautiful Texas mesquite smoked bbq. I really don’t like bars, but as I stepped into the cool darkness of Stubbs, it was like being home. The young bartender met me with a smile as I asked if they did carryout. He said sure, grabbed a menu and seated me at the closest table. For once, I was comfortable. Comfortable in my own skin, in a bar, and most of all comfortable with the decisions looming before me. Food in hand, I walked back down the street to the pick-up. (Grateful of not being towed.) I walked by this car and a giggle escaped from deep inside somewhere. At first my thought was, this city’s motto is “Keeping Austin Weird” and wondered how that could be so easy. 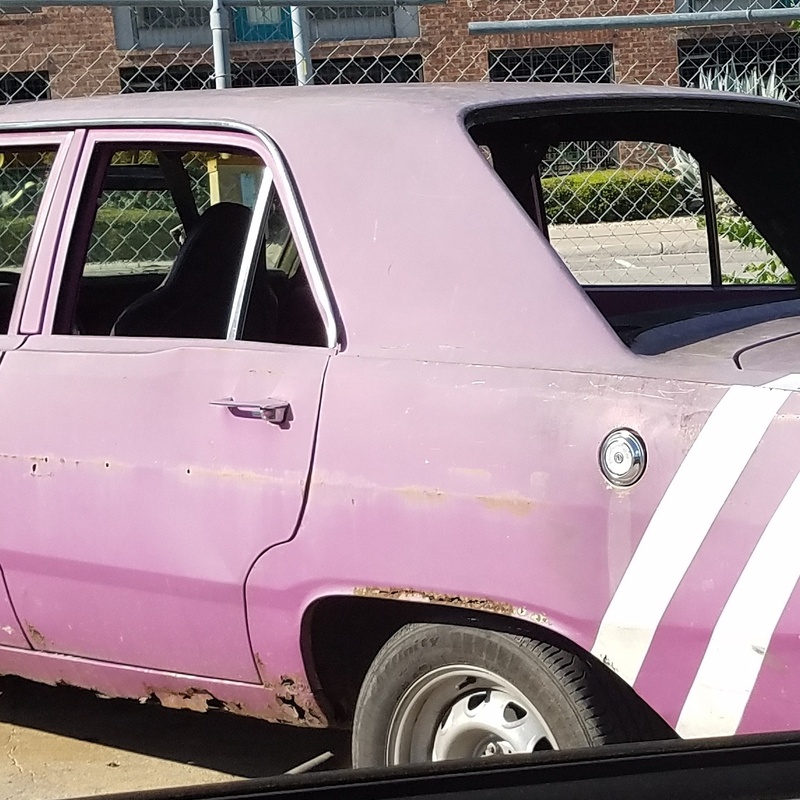 The only glass is the front windshield, the rust holes are large, and what is up with that purplish color and new white stripes?!? I giggled. As I got into the truck, I knew I had to take some pics of this ‘work in progress. It dawns on me that this old car and I had so much in common. This is a 68/69 Dodge Dart, we are close to the same age. Life has not always been kind but I am sure this car has also seen some wonderful, happy times too. She has been abused also but she runs well. Now, even though she looks pretty rough, someone loves her enough to start working on her. That gives me hope. This crappy little old Dart, sitting in an employee parking lot touched my soul. It was as if the Creator said pay attention. Listen to me and I will help fix you too, you are a work in progress. We are all a work in progress. A rough, torn up shell that if we choose can be something better. So many things have come to light in the past week as we were stuck in the hospital. I am still trying to process it all, but I know it’s time to pit this old car back on the road. You made me smile. A classic should carry a little rust, proof of the steel in body and spirit.